Pasang is a traditional game of Brunei. forming a pattern. There is a catalogue of more than 30 different patterns. kain songket or kain tenun, Brunei's traditional cloth. board is empty, or when a player runs out of moves. the annual birthday festival of the Sultan of Brunei. 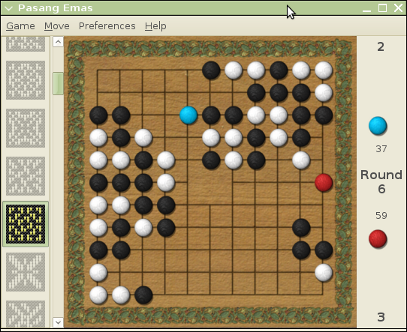 Pasang Emas brings this unique game to your computer.